The North East's set to benefit from a £15 billion programme of improvements to roads across England. 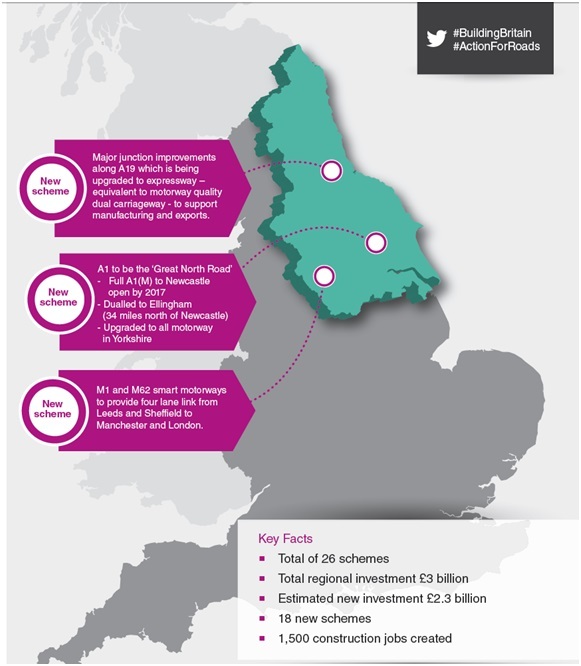 Yorkshire and the North East together will benefit from 18 new schemes worth around £2.3 billion, creating an estimated 1,500 construction jobs. "Today I am setting out the biggest, boldest and most far-reaching roads programme for decades. It will dramatically improve the network and unlock Britain's economic potential. Roads are key to our nation's prosperity. For too long they have suffered from under-investment. This government has a long term plan to secure the country's future and this £15 billion roads programme is demonstration of that. It will directly benefit hardworking families across Yorkshire and the North East." * A second Tyne Tunnel opened in 2011, widening the A19 under the river to two lanes in each direction. Spending during the next parliament on the local and national roads network across Yorkshire and the North East will be boosted further by maintenance funding worth £1.6bn. "World class infrastructure is vital if we are to build a stronger economy, but it matters in other ways too. It invigorates communities and gives people more opportunities to get on in life. This is why I have ensured that this government has prioritised funding roads, and railways, at a high level for future generations. For decades our roads have suffered from under investment, so I'm particularly delighted to be able to announce this expansive range of new road schemes today. Investment on this scale is only possible because we have taken the difficult decisions needed to control our public finances and stuck to our recovery plan which is now delivering strong growth and record numbers of jobs. "